Students at the EPMA's 2013 Summer School. 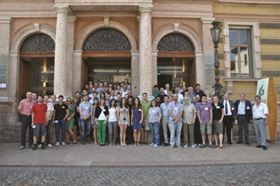 The annual Powder Metallurgy Summer School, organised by the European Powder Metallurgy Association, EPMA, provided 52 students, from a variety of academic and industrial backgrounds, with an introduction to powder metallurgy (PM) by a number of highly regarded academics and industrial lecturers. Professor José Torralba from the Universidad Carlos III de Madrid coordinated the event in conjunction with Professor Alberto Molinari and his team from the University of Trento, with administrative support from Joan Hallward and Rachel Burton-Pye of the EPMA. 52 students from throughout Europe were able to discuss and solve problems with 25 PM experts drawn from both industry and academia. In the University of Trento’s laboratory facilities the students learned about ‘Impact resistance of low alloyed PM steels’, ‘Microstructural analysis and Microhardness’ and ‘Hardenability and sinterhardenability by dilatometry’. As part of the practical side of the event, the students visited two companies: Mimest, who produce typical MIM parts, and Eurocoating, a medium sized company working in biomaterials, to be shown how the theory from the classroom is applied in industry. “This year’s Summer School programme has benefited from University of Trento’s superb laboratory facilities and well located hotels,” said Joan Hallward, summer school coordinator. Work on the 2014 EPMA PM Summer School is under way, with details being released later in the year via the EPMA website.